Oftentimes, there are companies that need powder and bulk material systems and controls for their specific material processing, handling and storage that may fall outside of the typical food, baking, agricultural, and feed industries. Sterling Systems & Controls, Inc. recognizes Your Industry, these other industries, and is adept at handling their specific applications. 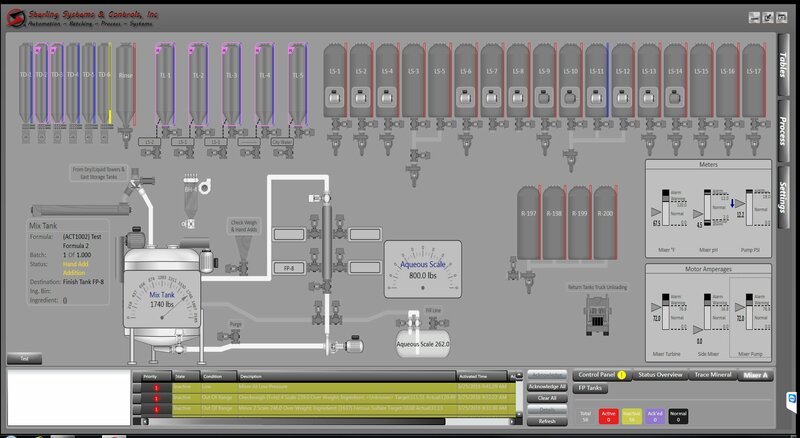 We have worked for over 40 years to create customized systems and controls solutions for dry bulk and liquid processing that incorporates a multitude of industries. Rubber Compounding: The first step in most rubber manufacturing processes is compounding. This requires the accurate batching of ingredients together for further process. Most often to produce a rubber compound a combination of plastic resin (pellets, flakes, powders, or liquid) is combined with other materials, including liquids and/or bulk solid materials. Sterling Systems & Controls, Inc. has designed and supplied customized batching systems for rubber compounding applications where industrial hoses and fittings, as well as other products, are manufactured. The rubber batching systems typically include a minor ingredient batching system, a hand-add semi-automatic hand-add batching system, dust collection, automatic indexing of totes (also provided by Sterling Systems & Controls) and a state-of-the-art automation control system including standard Allen Bradley PanelView+ touchscreen HMI’s and PLC, and a Sterling Systems customized FactoryTalk ME software application. Electrical controls are also provided. Frac Sand: Extracting natural gas through hydraulic fracturing a layer of impermeable shale is called Fracking. Fracking has significantly advanced the amount of natural gas produced in North America. Frac sand is a key component of the fracking process. Frac sand handling systems and automation controls are necessary to ensure efficient delivery of sand to the well pads. A main ingredient in the fracking fluid is sand. Frac sand is a special type of sand. This is because the sand grains left behind during the fracking process hold the fractures open. This enables the extraction of the natural gas. The building of frac sand facilities provides for the distribution of the sand by truck to the fracking well pads. Bringing the frac sand to the facility is by railcar and is then transferred from railcars to silos for distribution. Unloading frac sand from the silos into individual trucks for delivery to the well pads. Sterling Systems is a leading supplier of frac sand handling systems, process controls and plant automation for frac sand facilities. Railcar unloading, truck filling, and alarm handling are key components of frac sand handling systems.